Please refer to our stock # LE-31 when inquiring. Kon, dark blue, Indigo-dyed cotton haori woven in botan kasuri (peony ikat) technique. Cotton liner features pattern of a crane’s head within hexagons, representing tortoise shells; both crane and tortoise symbolizing long life. 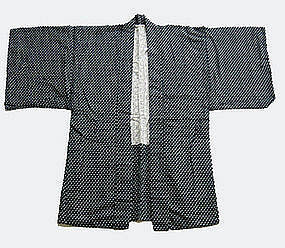 A haori is a jacket worn over the kimono when going out. In contemporary fashion, it can easily be worn over jeans for casual wear or slacks for a more elegant look. Excellent condition, ca. mid-late1900’s. L.42”(107cm) x W.49”(124.5cm.) Kasuri techniques came to Japan from Indonesia via Okinawa, and became highly developed here. Skeins of thread are bound at certain points before dying, and these undyed areas create the resulting patterns or images. The technique can be used for either the warp or weft yarn, or both. The resulting blurred edges of patterns created by this amazingly complex technique are the characteristic beauty of kasuri.